The National Theatre wanted to use its public spaces more imaginatively, and raise more revenue. The roof seemed to be an ideal place for receptions and corporate entertainment. It has spectacular views, is easily accessible from the foyer, and has service access from the back of house. A-EM responded to the brief by designing the Deck, a 200 square metre glowing box structure, made from tubular mild steel clad with polycarbonate panels. A tensile PVC membrane roof fits over the central space and is lit by LED fittings which produce kaleidoscopic colours. However, the site cannot take loading and it is exposed to high winds. The solution was to suspend the structure on a steel support, transferring loadings to bearing points. 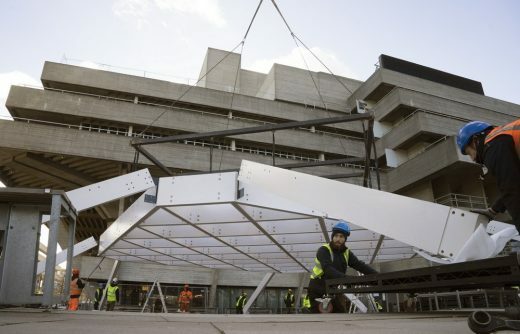 The pre-fabricated pavilion was craned into position and bolted together on site. It was designed to be dismantled, as initially planning permission was only for seven months each year. This is an inventive, cost effective design solution, on a complex and sensitive site. The Deck has proved a success – first season earnings were twice those predicted – and now has full permission for five years.